There were no reported road fatalities in the Republic yesterday. GARDAÍ HAVE SAID that there were no deaths on Irish roads yesterday during a Europe-wide initiative to combat the number of fatalities. Officers said they would like to thank all road users who assisted the success of Project Edward in Ireland but said that while there were no deaths, there is no room for complacency. Assistant Commissioner Dave Sheahan said that while Ireland’s road death stats are lowering, motorists need to remain vigilant. He said: “Last year, 2017, gave us the lowest number of road deaths in Ireland but we can never be complacent about road safety. Project Edward is an important initiative keeping road safety in the minds of all road users. During the 24 hours of Project Edward, GoSafe checked the speed of 129,250 vehicles. 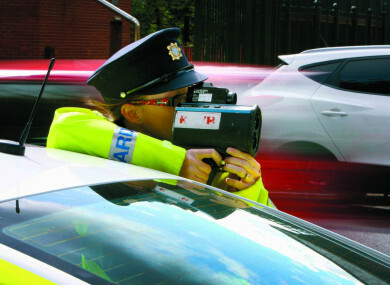 A total of 256 vehicles were detected travelling in excess of the speed limit. Email “Gardaí urge motorists not to become complacent on roads after Project Edward success”. Feedback on “Gardaí urge motorists not to become complacent on roads after Project Edward success”.